1. Green your Giftwrap – To cut down on waste during the holidays, consider wrapping your gifts with fabric, dish towels or fabric totes, all of which are reusable and look really cool. Or cut up and use paper bags (both from retail and grocery stores) into flat wrapping paper. You can decorate them with stamps, bits of old wrapping or markers. If you choose to buy wrapping, choose products that can be reused again before being recycled. When you get gifts, do what you can to reuse or recycle the wrapping – being creative can make your gifts look beautiful and unique. Recycle More! It’s easy to do! 2. Real or Fake – The Great Tree Debate Grist.org posted a great article about whether it is more eco-friendly to go with a real tree or a fake tree. Their call? Go for the real tree and try to support a local, sustainable grower. Our tip? If you cut the tree yourself, you can lengthen its life, know how far it has traveled to get to your home and meet the farmers. 3. Give Waste Free – give experiences instead of stuff. Try a years worth of date nights, tickets to theatre or coupons good for homemade dinners. Check out more ideas for a waste-free holiday from King County. 4. Do a Craft Project! Eve of Reduction shows how to make cool snowflake ornaments from recycled milk jugs. 5. Find Inspiration See more ways to decorate for the holidays on the local blog, Celebrate Green! From new products to new inspiring ideas, the mother-daughter team of Lynn Colwell and Corey Colwell-Lipson share tips to make every day a little more healthy and green. From recipes to gift ideas, they have lots of ideas for choosing wisely this season. You have the opportunity to make a difference to our local community when you gift local! What is gifting local? Why, shopping for gifts at those sweet neighborhood boutiques, shops and art shows, of course. 1. Every dollar spent at a local independent business generates three times more income, wealth, and jobs than a dollar spent at a national chain. Money made here stays here! 2. Local independent businesses give our city its unique personality and its vibrancy, making this an incredible and interesting place to live. By supporting local businesses you are supporting local artists, crafters, bakers and creators. 3. A healthy, locally owned economy is resilient! And a resilient economy creates meaningful jobs and a more secure future. 4. Because we believe that when our friends and neighbors do well, we’re all better off. 5. Relationships Matter! There is no greater joy that purchasing a local product from a company that hand-chose that item or even created it themselves. True holiday sparkle. Represent your neighborhood the friendly competition going on between neighborhoods? Take the FREE Gift Local Pledge and receive a welcome packet with special treats and offers from local companies! In the darkness of these winter months, the story of Austin Hay is uplifting and enlightening, especially in relation to the tiny house movement. Treehugger.com recently published an article about Hay, who built a 130 square foot home to take away to college. What resonates most with us is the idea that Austin wasn’t depriving himself of anything he needed. Instead the article suggests that his project was an “exercise in learning what’s enough space and enough stuff-and then optimizing your living space to enjoy it”. Last month we talked about way to make your heating more efficient. This month, as we eagerly await the winter solstice, we wanted to discuss lighting options for your home. A well-designed home ultimately offers lots of opportunities for natural light during the day, decreasing the need for daytime electricity. There are a variety of options to improve the natural lighting of your home during the daytime, including the installation of skylights or larger or additional windows. Another option for increasing daylight are solar tubes. Solar tubes reflect natural daylight into the home, even into centrally located rooms with less invasiveness, more cost effectiveness and less solar gain/loss. As much as daylighting options help during the day, in the winter in Seattle even the best daylight benefits us for about 6 hours and supplemental light is extremely necessary. The most energy efficient option for your home is choosing LED Bulbs and all of your lights on dimmers, so you are only using the electricity you need. There is now a wide array of conversion bulbs on the market, including decorative bulbs and replacement tubes for fluorescent fixtures. CFL Bulbs (the twisty kind that are readily available everywhere and may be what you think of when you think of energy efficient lighting) are only 2nd best, and are still a ways off from LED. One major problem with CFL’s is the issue of dimming, which usually offers an opportunity to use less electricity. Normally, dimmers work by breaking up the amount of electricity reaching the light fixture and actually making the light flicker (though invisible to the human eye). This is fine for a traditional light bulb, but is not compatable for the way a CFL bulb works. A dimmer (even when not used to dim) dramatically shortens the life of a CFL bulb (even the ones on the market that say they are dimmable), making the CFL last a very short period of time. Similarly, because CFLs are more sensitive to heat than ordinary bulbs, they should not be used in air-tight fixtures and recessed cans unless they are specifically rated for such use. The heat build-up will harm the electronic ballast and can also dramatically shorten its life. Finally, in addition to their persnickety nature, CFL’s contain a small amount of mercury and need to be recycled through special drop-off locations and not tossed into the regular garbage. If you do nothing else, consider investing in dimmers and using them. Dimmers on incandescent and LED bulbs reduce the amount of energy you use when you reduce the light you use. By only using the amount of light you need, you can reduce your consumption of electricity. 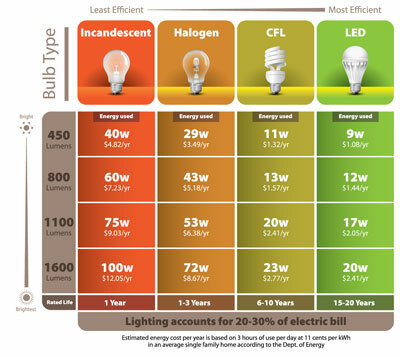 Give us a call if you would like to get more advice on how to choose energy-efficient lighting solutions for your home. Compact florescent bulbs and LED’s are now cheaper to buy and easier to find than ever before! The more specialized the bulb, the more likely you’ll have to shop online, but there are a plethora of options in both technologies and stores are following demand by carrying more in stock all the time. Save more with Seattle City Light’s Twist & Save Program, which provides instant savings on the bulbs at in-city hardware stores. Laura, Sydney and Vivian hit the streets as a part of the CoolMom’s team sharing “Don’t Idle, Kids Breathe Here” advice with drivers at the Fauntleroy Ferry Dock. 10 seconds of idling uses more fuel than turning off the engine and restarting it. An idling vehicle emits 20 times more pollution than one traveling 32 mph. Idling 5 minutes daily emits 30 pounds of toxic pollutants and 300 pounds of carbon dioxide in a year. Wait until everyone is settled in the car before turning the key. Turn it off at stoplights, drive-thrus, any time you idle for 10 seconds or more. Start Counting! You will be surprised at how many opportunities you have to save gas, money and the planet!